fTLD Registry Services’ (“fTLD”) Technical Guide to Security Requirements (the “Requirements”) is designed for technical staff and third-party providers of financial organizations and provides guidance on implementing the Requirements for a .BANK or .INSURANCE domain name (collectively “fTLD Domain”). This guide describes the Requirements that must be deployed by registrants (organizations that register domain names) and registrars (entities authorized by fTLD to offer fTLD Domains) in order to comply with the Requirements and fully benefit from their fTLD Domains. Registrant Security Requirements (Domain Name Owners): Registrants that use their domain names (i.e., they resolve on the internet) are required to implement security technologies such as Domain Name System Security Extensions (DNSSEC), Transport Layer Security (TLS)/Encryption and Email Authentication. fTLD Operations Pledge: fTLD and its approved registrars are required to comply with policies and procedures to ensure the secure, stable and reliable operation of an fTLD Domain for registrants. fTLD has compiled a list of publicly available, free resources that can be helpful in understanding whether the implementation of an fTLD Domain addresses the defined Requirements, and it’s available at ftld.com/domaincheck. Although these resources are useful, they are not the basis for fTLD’s Requirements monitoring service and are not exact checks against the Requirements. Communicate more securely with customers, third-party providers and other stakeholders. Digital Assertion, Verified Digital Identity and Multi-Factor Authentication—following the eligibility verification process, eligible fTLD Domain participants will be issued multi-factor authentication credentials, which are required to change domain registration data via an online process with the respective registrar. An equivalent multi-factor authentication process will be used by registrars that manage this process in an offline setting. Strong Encryption (i.e., Transport Layer Security) to ensure confidentiality and integrity of communications and transactions over the internet. TLS is an internet standard for providing encrypted communications over the internet. fTLD Domain participants are restricted from implementing known weak or vulnerable versions of TLS protocol and cipher suites. DNS Resource Records Restrictions require fTLD Domain registrants to comply with restrictions on authoritative name server Fully Qualified Domain Name (FQDN) and Domain name system (DNS) resource records. The FQDN of authoritative name servers for an fTLD Domain must end in an fTLD Domain (e.g., ns1.bankname.bank, ns1.insurername.insurance). DNS resource records (e.g., CNAME, DNAME, MX) may be used to alias to out-of-zone domains (i.e., non-fTLD Domains) and are subject to compliance with the relevant Requirements. Requirements may need to change to meet the evolving landscape of risks and threats on the internet. fTLD intends that its Requirements—and likewise this guide—will change to stay ahead of the threats it is designed to mitigate. Digital assertion is a process by which a network service (“verifier”) authenticates a user and generates an assertion about the result of the authentication to another network service that relies on that authentication to determine if services should be provided. Digital assertion allows for an individual or organization to assert its identity, have a means to prove that identity, involve a trusted organization to authenticate that identity and then assert that identity to gain access to an authenticated session. Often the assertion is a time-based token that acts as a credential for access to network systems. What is the fTLD Domain Security Requirement for Digital Assertion? an equivalent process, during the registration process. In particular, Registration Authorities (i.e., registry operator and registrars) must provide an adequate description of their requirement for digital assertion, or equivalent process using best current practices, and how it will be applied to registrars and registrants. How Does Digital Assertion and Verified Digital Identity Work? While the internet was originally designed with a model of anonymity for its transactions, this is not appropriate in an fTLD Domain environment. Identity management involves establishing who is using a service and digital assertion and verified digital identity are techniques to enhance the level of trust in knowing who is using it. The fTLD Domain requirement mandates a strong approach to authentication. This is crucial in an fTLD Domain environment as a recent study highlighted that nearly 82 percent of cybercrime incidents targeted user credentials. operator-registrar and registrar-registrant interactions. Interactions with customers are not affected by this requirement. A typical example is an authentication token that displays a time-limited random number. The combination of the personal information and the number displayed on the token constitute the two factors. Including two elements makes it more difficult for an unauthorized person to access the account because they would be required to know the personal information and have the access token as well. According to research, multi-factor authentication2 can drastically reduce the incidence of online theft and other network-based fraud because access or theft of a password alone is not enough to gain access to online services or information. provide an adequate description of their policy for digital assertion or an equivalent process. The policy should use best current practices and describe how itwill be applied to registrars and registrants. An identity assertion service that allows assertions about digital identity to be passed between security domains within the registry/registrar/registrant environment. While some in the registry/registrar environment have already developed a digital identity approach, it may be new to others. Multi-factor authentication is becoming easier to implement. In addition, multi-factor authentication (especially the second-authentication factor) is becoming easier to outsource. Network equipment vendors, telecommunication providers and specialist digital identity management companies have emerged in this product space and offer solutions that can be integrated with existing registration/credential granting systems. Adds the capability to authenticate the trust chain of data provided by the DNS. DNSSEC also provides a platform for future security technologies. DNSSEC is a backward-compatible technology that extends the DNS by providing origin authentication of DNS data, data integrity and, where needed, authenticated denial of existence of domain name and resource records. It is important to understand that DNSSEC does not solve every security problem related to the DNS. DNSSEC does not provide confidentiality of DNS responses or communications between DNS clients and servers. It also does not prevent attacks on DNS servers using other parts of the network stack—for instance, implementation of DNSSEC does not protect against Distributed Denial of Service (DDoS) attacks. As any organization may be targeted by malicious actors using a DDoS attack, it is advisable that their security plan, and that of their DNS provider, include a DDoS mitigation plan. Despite some of the drawbacks, DNSSEC ensures users are not hijacked en route to their intended destination and thereby builds trust and confidence to users conducting online activities. What is the fTLD Domain Security Requirement for DNSSEC? sub-zones for domains that resolve in the DNS. Registrars must communicate the DNSSEC requirement to their Registrants in their Registration Agreements and store Registrant’s DNSSEC records. Registrars must support DNSSEC and registrants must deploy DNSSEC for each domain and subdomain name that resolves in the DNS. DNSSEC uses public key cryptography to authenticate domain names and verify the integrity of traffic to and from those names. The internet relies on the ability of people and computers interacting at a distance. A customer may not have ever seen or met the principals of an internet business, but they still have to be able to exchange information with them. How does that customer know that the information sent from the business is legitimate and not an imposter? In the real world there are many physical clues and cues that guide the application of trust to transactions, however most of these are simply not available on the internet. One of the keys to building private and reliable communications between people, businesses and organizations on the internet is to use cryptography. Many types of cryptography are in use in the public internet, but DNSSEC uses a very specific type: public key cryptography. DNSSEC allows a user to make a traditional query about an address and by using a combination of typical DNS queries and the addition of verifiable trust, ensure that the server answering the query is authoritative and the response to the query has not been tampered with during transmission. This is illustrated below for www.example.bank. Public key cryptography is a secure, easy-to-deploy method for ensuring that messages and transactions can be changed into a form that can only be read by the intended recipient. Each person, business or organization gets two “keys.” One, the “public key” is given to all possible recipients and made public. The other, the “private key,” is kept secret and in the hands of the sender. Messages encrypted with the “public” key can only be decrypted with the matching private key and messages encrypted with the “private” key can only be decrypted with the “public” key. When sending a message it is encrypted using the public key of the recipient. Given the only person who can decrypt the message is the person who has the matching private key, it doesn’t matter if another party intercepts the message. Even if someone could intercept or get a copy of the encrypted message, they could not decode as they would not have the matching private key. Public key cryptography has wide use in technologies such as Secure Sockets Layer (SSL), Transport Layer Security (TLS), Pretty Good Privacy (PGP) and Virtual Private Networks (VPNs) as a strategy for protecting messages on the internet. One of the features of public key cryptography that is of special importance is digital signatures. Simply put, if a private key is used to generate a signature of a document or encrypt a message, the recipient can verify that it is legitimate by verifying the signature against the public key of the sender. As with protecting the confidentiality of messages, the digital signature relies on the essential property of the key pair; messages signed with the private key can only be verified using the matching public key and vice versa. AUTHENTICATION—Digital signatures are regularly used to authenticate the true source of messages. When a private key is used to sign a message, a valid signature indicates that the message was sent by the holder of the private key, and this ensures sender authenticity. INTEGRITY—In addition to being confident that the message came from who purported to send it, it is also important to ensure that the message has not been altered in any way during transmission. This is often referred to as “data integrity.” A digital signature can ensure that the message was received just as it was sent: if a message is digitally signed, any change in the message after it was signed would invalidate the signature. NON-REPUDIATION—If a sender has signed some information, they cannot, at a later time, deny having signed it. Similarly, that someone has access to a public key of another does enable them to use that public key to forge a valid signature. DNSSEC makes essential use of the first two of these properties of digital signatures. The fundamental feature that DNSSEC provides is to guarantee that the answer received as a result of a DNS query is exactly the answer that corresponds to the authoritative state of the DNS records related to that query. The Time-to-Live (TTL) value is one day (86,400 seconds). TTL is a value that controls how long any name server may cache the information that it may acquire in a query. The Flags value is 256, indicating that this is a Zone Key. The protocol value is a constant number: 3. The field that follows is the identifier for the public key algorithm, and the value 8 indicates RSA/SHA-256. The RR value is simply the encoding of the public key that the DNS client will use to validate the signed zone. A Resource Record Set is a collection of resource records in a DNS Zone file that have a common name, class and type. In practice this means there would be a resource record set associated with each part of a DNS query response. Another way to say this is that the RRSIG is the Zone Administrator’s private key applied to the part of the zone requested by the client: a digital signature for the Resource Record Set. The zone name is followed by the TTL value and the Class field. RRSIG indicates the resource record type. These three fields are followed by a “Type Covered” field which indicates that this is a signing of the A resource records in “host.example.bank.” The next field indicates the name of the algorithm used to sign the resource record set. The number “3” indicates that there are three labels in the original zone name (in this case, “host,” “example,” and “bank.”). The next field (86400) indicates the original TTL value for the covered A resource record set. Following that are date stamps indicating when the resource record set was signed and when the signature expires. The key tag is 2642 and the signer’s name is “example.bank.” The rest of the RR value is the digital signature of the resource record set. The DNSKEY and the RRSIG can be used to check the authenticity and the integrity of a DNS response, but only when there is a response. There needs to be a way to check the authenticity and integrity of a response when the DNS server is unable to find a result for the DNS query. The DNS doesn’t have a built-in resource record for this, so one was invented called the NSEC record. The NSEC record was created so that something is returned in the event the resource requested does not exist. When a client makes a DNS query and either the name does not exist, or if the resource record type requested does not exist, the NSEC record is returned as a negative answer: a digitally signed indication that the name or resource record was not found. alfa.example.bank. 86400 IN NSEC host.example.bank. alfa.example.bank. One implication of this is that, by collecting the information from the NSEC records, the entire contents of the DNS zone can be enumerated. To prove a zone file’s DNSKEY is truly authentic, the client first verifies that the parent’s copy is authentic. It does this by calculating the signature of the key inside the DS record using the parent’s public key. If it matches the RRSIG associated with the DS record, then the parent copy is authentic. Next, the parent copy is compared against the child’s copy—if they are the same, the parent has authenticated the child’s DNSKEY. While there may be times when the parent zone’s public key is suspected of being compromised, the chain of trust means that the parent zone’s public key can be checked against the copy of the parent’s zone held by the parent of the parent. The same process can be used until the DNSSEC client encounters a “trusted” DNSKEY. The ideal “trusted” DNSKEY is that of the root zone—and the good news is that the root zone has been signed since June 2010. As always, the first four fields are the name, TTL, Class, and resource record type (this time, the DS record). 60485 is the key tag for the corresponding “dnskey.example.bank” DNSKEY resource record. The number “8” indicates the algorithm used by “dnskey.example.bank” to construct the DNSKEY resource record. The value “1” indicates the algorithm used to construct the digest and the remainder of the record is the digest of the DNSKEY in hexadecimal format. In essence, DNSSEC simply adds additional data to the responses that allow the DNS client to authenticate the resource records returned by the server. If the string or the resource record being queried is not in the zone, the authoritative name server instead returns the NSEC record and its accompanying RRSIG record to indicate the negative response. The DNS client can always take the returned RRSIG data and calculate its own copy of the signature to see if they match. The DNSKEY is needed to do this and if the client has not validated the DNSKEY within some set time period, the client needs to also validate the DNSKEY using the DS record stored at the parent zone. Each parent zone public key must also be validated in turn. Once the chain of trust is built and the signatures match, the DNS response can be considered to be validated and authentic. To meet this requirement the zone, its parent zone, that zone’s parent zone, the fTLD Domain and the root of the DNS all must be signed. To tell if a zone is signed, all you need to do is see if it has a DNSKEY record. If it does, the good news is that it supports DNSSEC. Fortunately, the root and fTLD Domain are already signed and have DNSKEY records. Suppose we want to sign example.bank—what would we need to do next? Every time the zone changes (perhaps a new domain is added to the example.bank zone, or the key needs to be updated) the zone must be resigned and the publishing task must be completed again. The process used for replacing one key in a zone with another is called a key rollover. Keys in the DNS have a limited lifetime for security reasons. However, for fTLD Domain customers it is important that the existing chain of trust is not broken when the key rollover takes place. A key rollover takes place when the records generated with the newest private key are first introduced into the zone. The key pair is often generated well in advance and the public key may also have been made public well in advance. Both key-signing keys and zone-signing keys are routinely (usually on a scheduled basis) rolled over. The process of generating keys, signing zones, generating, uploading and publishing DS records and managing key rollover is complex. Registrars must support DNSSEC and provide tools for registrants to help publish DS records. Registrants must also support DNSSEC and have the tools for generating keys, signing zones, generating, uploading and publishing DS records and managing key rollover. In cases where the registrant outsources the management of their fTLD Domain zone, they must ensure that the third party is able to successfully generate keys, sign their zones, generate and upload the DS records and manage key rollovers. For organizations that choose to outsource the DNSSEC management activity, there are a variety of vendors with service offerings that will comply with the fTLD Domain DNSSEC requirement. Web hosting companies, registrars and DNS management services may have service offerings that can assist a registrant in complying with the DNSSEC requirement. Message Confidentiality—TLS provides a mechanism for encrypting the messages between application clients and servers with the aim of ensuring that, even if someone captures the messages as they were in transit between the sender and destination, the messages could not be read. Authentication—TLS provides a mechanism to validate the identity of the endpoints of the communications. Servers authenticate themselves to clients and clients, optionally, authenticate themselves to servers. Message Integrity—TLS provides a mechanism to ensure that messages are not changed as they move between client and server. TLS is often associated with protecting the contents of messages, but the protocol is also very useful in protecting against threats such as masquerade attacks, man-in-the-middle or bucket brigade attacks, rollback attacks and replay attacks. What are the fTLD Domain Security Requirements for TLS? Registrar and Registrant access to registration systems must be mutually authenticated via Transport Layer Security and secured with multi-factor authentication, NIST Level 3 or better. Registration Authorities and Registrants are required to use encryption practices defined by NIST Special Publication 800-57, or its successor, for all electronic communication between parties, including but not limited to web access, mail exchange, and file transfer, avoiding the use of unencrypted protocols to prevent tampering with messages. Transport Layer Security (the successor to SSL) must be implemented as defined in the requirement. Ensure that message confidentiality and integrity is part of the authentication process for access to registration systems. Ensure the benefits of TLS are present in all interactions between registries-registrars, registrars-registrants, and registrants and their customers including email and web interactions. Specifies the TLS protocol version and related cipher prohibitions. Public key certificates (also known as a digital identity or TLS certificate) must be deployed to secure fTLD Domains and subdomains to meet the TLS/Encryption requirement. Registrants may wish to use a wildcard certificate (e.g., *domainname.BANK; *domainname.INSURANCE) which allows a public key certificate to be used across single-level subdomains. Public key certificates must not be generated using any prohibited cipher suite components. Web connections: TLS v1.1 or greater should be maintained. TLS v1.0 may be used to serve educational information about the importance of browser hygiene and provide guidance about how to update a browser. Registrants should communicate to customers/visitors to their websites a specific date when access to their websites using TLS v1.0 will no longer be possible. Server-to-Server Email: For domains sending or receiving email, TLS v1.1 or greater must be offered at the highest priority. However, when exchanging mail with a non-fTLD Domain earlier versions of TLS/SSL are permitted, including, as the lowest priority, defaulting to unencrypted email when it is not possible to provide encryption. Other services: TLS v1.1 or greater should be used and TLS v1.0 does not need to be disabled at this time. RFC 5746 must be implemented (prevents a known man-in-the-middle attack). The following is a non-exhaustive list of cipher suite components (authentication, encryption, message authentication code and key exchange algorithms) excluded from use with in-zone domains and in the generation of TLS certificates: Anon, CBC, DES, 3DES, GOST 28147-89, IDEA, SEED, WITH_SEED, MD5, NULL, SHA (SHA1), RC4, EXPORT, EXPORT1024 and SRP. The connection is private. Every message between two endpoints is secured by encryption. A shared secret is used for the message encryption. The shared secret is generated uniquely for each connection between the two endpoints and is based on the results of another protocol (often the TLS Handshake Protocol). The connection is reliable. Every message has a checksum applied so that the receiving end can always check to see if the message that was received is exactly the same as the message that was sent. Each end of the communications channel can be authenticated (that is, they can be forced to prove that they are who they say they are). This authentication takes place using public key cryptography. In traditional web applications only the server is authenticated. The negotiation of a shared secret is secure. The secret that is generated and shared (to be used by the Record Protocol) is impossible for an eavesdropper to obtain. The shared secret cannot be discovered, even by attackers who place themselves in the middle of the session. The negotiation is reliable. If an attacker attempts to insert themselves into the negotiation process, they can be discovered by the peers during the negotiation. The combination of the negotiated secret provided by the TLS Handshake Protocol and the symmetric cryptography and checksums provide a secure communications channel for any application layer protocol on the internet (e.g., World Wide Web, email, VoIP). The handshake is essential to TLS, but also fairly complex. The following overview describes the handshake when both ends of the connection must authenticate themselves to one another. The client begins the handshake by sending an initial message to the server indicating the highest version of the TLS protocol that it supports, a list of cryptographic suites it supports, a list of message compression methods it supports and a random number. First, with a message with the highest version of the TLS protocol that the two sides have in common, the best of the cipher suites that the two have in common, the most efficient compression methodology that both support and a random number. Second, it sends the server’s Digital Certificate. Third, it sends the public key for the server. Fourth, it requests that the client send a copy of the client’s Digital Certificate. Fifth, it sends a short message to indicate that it is done with this part of the negotiation. First, with a copy of its Digital Certificate. Second with a message containing the public key of the client. Third, the client uses its private key to sign the previous handshake messages. This signature can be verified as authentic by checking it using the client’s certificate’s public key. 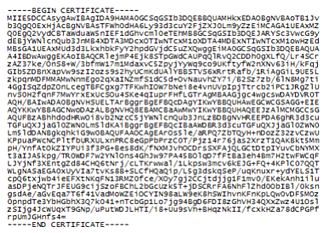 This proves that the client has access to the private key of the certificate and thus owns the certificate. The server and client then send messages using the random numbers that have been exchanged to generate a common secret. For the remainder of this connection, all cryptographic material is generated from this common secret. Once the common secret has been generated the client sends a message to the server telling the server that all future communications sent to the server will be authenticated and encrypted. The client sends a last message indicating that its part of the handshake is complete. The server decrypts the last message of the client (if the decryption fails, the handshake is considered to have failed). The server sends a message to the client telling the client that all future communications sent to the client will be authenticated and encrypted. The server sends a last message indicating that its part of the handshake is complete. The client decrypts and verifies the last message from the server. The handshake is successful and the application continues with all messages encrypted in exactly the same way as their “last messages” in the handshake. TLS is a powerful tool for ensuring secure channels of communications. However, there are known attacks on the protocol and every security professional working with an fTLD Domain should be aware of the known vulnerabilities of TLS. Details are beyond the scope of this document, but a summary is available here: https://tools.ietf.org/html/rfc7457. When using TLS, each side of the connection can use the digital certificate to try to validate its contents and the claim of identity for the entity. One of the fields that is often used for this is called the “Common Name.” Each side of the conversation can check the Common Name against what they expect. They can also check the expiration date of the certificate. Especially useful in these circumstances, both sides can check who issued the certificate. Digital certificates are issued by Certificate Authorities (CA). There are companies that offer a service to do validation of the identity information in the digital certificate and then issue certificates that they can confirm. These companies are often called Trusted Certificate Authorities. The real value of certificates appears when they come from a trusted source. The primary use for TLS in an fTLD Domain environment is in securing activity on the internet. The first requirement specifies that registrar and registrant access to registration systems must be mutually authenticated via TLS and secured with multi-factor authentication, NIST Level 3 or better. When the registration system is an application running in cooperation with a web server, this implies that the clients and servers must have digital certificates, must support at least the TLS specified in the Requirements, and must be able to fully negotiate the handshake that sets up the secured session. The second requirement specifies that all electronic communication between parties, including, but not limited to, web access, mail exchange, and file transfer, use encrypted protocols to prevent tampering with messages. The third requirement specifies that TLS must be implemented using trusted protocol versions because some early implementations of TLS and some cipher suites supported by the protocol are known to be insecure. A public key certificate must be used to meet this requirement. fTLD Domains must support the TLS specified in the Requirements. Changes to TLS protocols are ongoing and registrants should confirm the current requirement. Registrants and registrars will be notified of changes to any Requirements on a timely basis. In addition, a series of cipher suites which are currently known to be insecure are not permitted for use with an fTLD Domain and are identified in the third requirement. Detailed information on the TLS/Encryption requirements is available in the Implementation Guidelines here: https://www.ftld.com/security. The steps required to implement TLS on a web server is discussed in the next section of this document. If the services are built to be used via a web browser, access through the https:// schema makes TLS implementation straightforward. Services built to be used through other tools, for instance through an iPhone, Android or Windows Phone app, need to use the secure transport APIs for the particular platform being targeted. However, this does not prohibit an fTLD Domain from using content from other services. As an example, if an fTLD Domain incorporates information from a social media feed, the content from the social media may not originate or be hosted from an fTLD Domain service. It is acceptable to incorporate content from other sources in an fTLD Domain. In addition to implementing TLS, registrars and registrants may choose to implement HTTP Strict Transport Security (HSTS). HSTS is effectively a backup for TLS. It was engineered to ensure that security remains intact even in the case of configuration problems and implementation errors. HSTS protection is simple to implement: you set a single response header in your websites. After that, browsers that support HSTS will enforce it. While the use of HSTS is not currently a requirement, it is strongly encouraged by fTLD and may become a requirement in the future. Once implemented, HSTS does not allow any insecure communication with the website that uses it. It achieves this goal by automatically converting all plaintext links to encrypted ones. It also makes it harder for a user to click-through certificate errors and warnings which may be a leading indicator of a more significant problem such as malware or a man-in-the-middle attack (Certificate errors are a potential indicator of an active MITM attack. Studies have shown that almost all users click through these warnings without heeding them.). Generating a server certificate request file. A certificate request is essentially certificate data that has not been signed by a Certificate Authority (CA). The CA turns the request into a certificate by signing it. Building the certificate request file is a task that is specific to each operating system and web server. The end of the process is simply a file that will be transmitted to a Certificate Authority. Generating a server certificate. To submit your TLS server certificate request file to a Certificate Authority you must follow the enrollment instructions the CA provides. Most CAs publish their enrollment instructions on their website. Enrollment instructions vary among commercial CAs and for different server certificate types. The end of the process is a digital certificate signed by the CA and returned to your organization. Installing a server certificate on the web server. Most web servers and operating systems have Digital Certificate management and administration tools that allow you to install the new Digital Certificate on your server. Once the Digital Certificate has been installed the web server must be configured to use it as part of the TLS Handshake. Configuring TLS on a web server. Each web server hosting registration system will have to be configured to support the current version of the requirement. Details of configuration are specific to each web server and operating system, but often it consists of adding support via an included module or selection of a configuration option. Some examples of this are Microsoft IIS and Apache . fTLD Domain servers should also consider configuration of HSTS as a default response header. Generating, acquiring, and installing client certificates. As mutual authentication via TLS is required, client certificates are necessary for those computers on which browsers are accessing the registration system. The registrar must deploy a system for generation, acquiring and installing client certificates. Ensuring that TLS clients trust the CA certificate. This generally means making sure that the CA’s certificate is stored in the client’s trusted root certificate store. As an example, in the case of electronic mail, one approach for meeting this requirement is to implement STARTTLS. STARTTLS is an open protocol that improves upon plaintext protocols such as email and file transfer. Essentially, STARTTLS provides a way to upgrade older plaintext protocols to an encrypted, TLSbased connection. The advantage of STARTTLS is that it is an open standard and extensions are provided for email (in RFC 2595 and RFC 3207), instant messaging and presence (in RFC 6120), and directory services (in RFC 2830). Today most mainstream providers of services—especially email and file transfer—employ STARTTLS as the alternative to these legacy approaches. For instance, Google has a real-time report on email encryption available at: google.com/transparencyreport/saferemail/. Commercial software supporting these internet services widely supports STARTTLS. As an example, Microsoft Exchange uses a feature called Opportunistic TLS that enables TLS by default for the server. This enables any sending system to encrypt the inbound SMTP session to Exchange. By default, Exchange 2013 also attempts TLS for all remote connections. Traffic should be encrypted as the default option. Services in an fTLD Domain should always attempt to have transmission encrypted. The only case where defaulting back to plaintext for transmission is in extraordinary cases: for instance, sending emails to legacy domains. STARTTLS should always be attempted, but some connections will not support TLS. However, since all modern browsers support strong encryption, there should not be a fallback for HTTP connections. Much of the communication on the internet still depends on one of the oldest internet services: electronic mail. Social networking and other mobile services have not changed this. More than ever, those wishing to do harm on the internet have a tremendous financial incentive to compromise user accounts, enabling theft of passwords, bank accounts, credit cards and other security violations. The original electronic mail protocols never envisioned the risks to consumers in simple email spoofing. In some cases, the simple insertion of a logo of a famous brand is enough to give email legitimacy with many users. Even sophisticated users can be fooled by fake messages. And large providers of mail services have to make very difficult choices about which messages to deliver and which ones they should not. DMARC is a technical specification, using the DNS and mail servers, to attempt to deal with some of these issues. The goal is to help email senders and receivers work to reduce the number of phishing attacks and other malicious email-borne activities. DKIM – DomainKeys Identified Mail is a technology that allows a mail receiver to check that incoming mail from a domain is authorized by that domain’s administrators and that the email has not been changed as it has gone through the network. fTLD recommends that both SPF and DKIM be used with DMARC. However, the requirement allows an administrator to use only one. In practice, email authentication is more effective in the presence of both SPF and DKIM records as email delivery rates will be increased. What is the fTLD Domain Security Requirement for Email Authentication? Registrants must publish a valid Domain-based Message Authentication, Reporting and Conformance (DMARC) record with a requested mail receiver policy of either quarantine or reject for domains that resolve in the DNS. It is recommended that DMARC records specify strict identifier alignment for both SPF and DKIM via the adkim and aspf tags. Also, for DMARC records published at an organizational domain level to set an appropriate sp: tag. When used to protect non-email sending domains, Registrants are required to publish a DMARC reject (p=reject) mail receiver policy. Benefit: The goal of this requirement is to provide an increased level of trust for email from an fTLD Domain. This is done by using an internet-standard approach to email authentication. This is a crucial requirement for ensuring that the electronic mail channel for an fTLD Domain is protected against the delivery of invalid or spoofed email purporting to be from an fTLD Domain. Implementation of email: When deploying DMARC during the implementation phase of email capabilities, Registrants may temporarily use a “none” (p=none) or “quarantine” (p=quarantine) mail receiver policy, but must change the policy to reject for ongoing operations within 90 days of deployment. Email authentication allows the receiver of an email to make judgments about the sender of the email. In addition, the sender can develop and publish a policy for email authentication. If a receiver can establish authentication of the source of email, then one of the most difficult problems for email can be avoided— spoofing also known as phishing. Spoofing is the ability of someone to pretend to be another organization and attempt to lure an email receiver into using a rogue website instead of an authentic website or into providing confidential information in order to compromise sensitive user information. For organizations using an fTLD Domain, email authentication is an essential part of establishing trust in email coming from their organization. Email authentication assists in the prevention of phishing attacks and also plays a role in emerging reputation and accreditation systems that are another part of establishing trust in email as a vehicle for communications between financial services organizations and their customers. There are two basic types of email authentication: internet Protocol-based approaches and cryptographic approaches. The internet Protocol approach, SPF, requires publishing information about legitimate email servers in the DNS for each domain being used. The other approach, cryptographic, attaches a signature to each message in a way that is difficult to forge, proving that the message came from the indicated sending domain. The industry standard for cryptographic authentication is DKIM. Today, companies are moving toward adoption of SPF, DKIM, or both. Major email providers such as Microsoft, Yahoo! and Gmail are using both SPF and DKIM to authenticate email senders. DMARC is a tool that uses SPF or DKIM to make decisions about incoming mail based on a published policy. The email authentication protocols are complex. While this section provides a basic overview and some examples, there are resources available to learn more about SPF, DKIM and DMARC. This section provides links to some of the available sources of information on the three protocols. In this section, fTLD provides an example for illustration purposes of what is needed to build an SPF policy record to meet the requirement. Registrants in an fTLD Domain zone are required to have an SPF or DKIM record. Similar to the DNSSEC resource records noted earlier in this guide, an SPF record is a resource record that identifies which mail servers are permitted to send email on behalf of your domain. The idea behind an SPF record is to prevent spammers from sending messages with forged “From” addresses at your domain. This is especially important in the case of an fTLD Domain where the goal is to establish high levels of trust between institutions and their customers. Email service providers (e.g., Google, Microsoft, Yahoo! ), on behalf of their customers, refer to the SPF record to determine whether a message purporting to be from your domain comes from an authorized mail server and then deliver it or not. For example, suppose that your domain example.bank uses your internal mail server. You create an SPF record that identifies your internal mail server (suppose it is mail.example.bank) as the authorized mail servers for your domain. When a recipient’s mail server receives a message from customerservice@ example.bank, it can check the SPF record for example.bank to determine whether it is a valid message. If the message comes from a server other than your internal mail servers listed in the SPF record, the recipient’s mail server can reject it as spam. It’s perfectly possible to have an SPF record that authorizes more than one domain as the legitimate server for your outbound email. 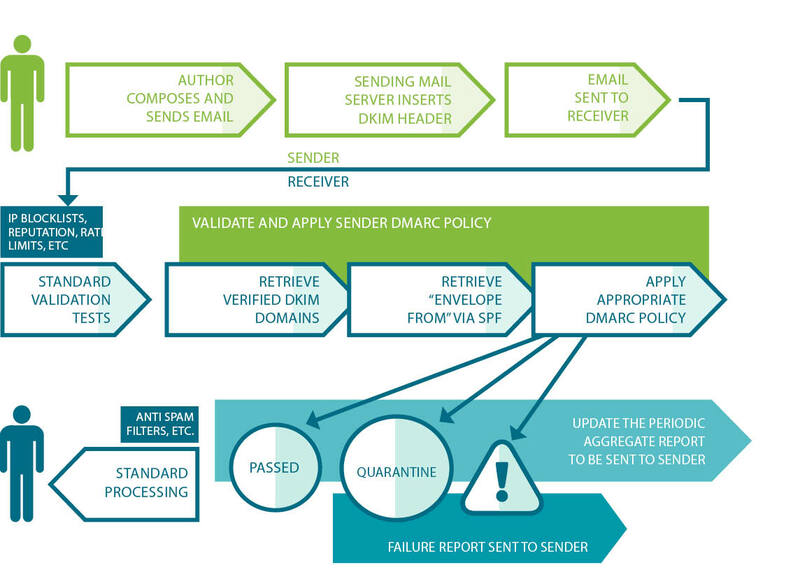 The diagram below shows how SPF is used to provide the “Envelope From” information as part of the DMARC standard. This record tells us that the only host that can announce itself as mail.boston.example.bank is mail.boston.example.bank (indicated by the “a”). Note if there was no SPF record for mail.boston.example.bank, the result would be None, rather than Pass or Fail. If the IP address of the sending server matches the IP address of mail.boston.example.bank, we have a Pass result for SPF. If the IP address of the sending server does not match the IP address of mail.boston.example.bank, we proceed to the next part of the SPF record, -all, which yields a Fail result. This record indicates that there is only one server that is allowed to send mail using the example.bank domain, and that is mail.boston.example.bank. Now that we know that, we look up the IP address of the mail.boston.example.bank host. If the IP address we find for mail.boston.example.bank matches the IP address of the incoming connection, then we have a match and the SPF test yields a Pass result. If the address does not match mail.boston.example.bank, then we go on to the next part of the SPF record, in this case “-all” which tells us that any other IP address yields a Fail result. The requirement identifies that registrants may use DomainKeys Identified Mail (DKIM) as one of the two options for authenticating email messages in compliance with DMARC. DKIM is an email validation system that allows a mail server to check that a domain is authorized to send a particular piece of email and verify that the message has not been modified during its transport through the network. DKIM works differently from SPF in that DKIM uses a digital signature to sign the message. This signature is added to the content of the message and the recipient can then use it, along with a public key published in the DNS, to verify that the message was sent by an authorized person and that the message has not been altered. DKIM consists of a signing and verifying application usually built into a mail server. k = key type (rsa is the default). All Signers and verifiers support the “rsa” key type. n = notes that may be of interest to a human. No interpretation is made by any program. This tag is optional. p = the public-key data, encoded as a Base64 string. An empty value means that this public-key has been revoked. This tag MUST be present. t = testing mode (“y” means that this domain is testing DomainKeys and unverified email MUST NOT be treated differently from verified email. Recipient systems may wish to track testing mode results to assist the sender.) This tag is optional. When this recipient gets the message, the server can look up the public key for example.bank and then calculate whether or not the message contents are the same as what was sent. It also allows the recipient to find out the signing organization’s message signing policy. We’ve seen how SPF and DKIM can add message authenticity to the sending process. The following diagram shows how DMARC fits into the process. A DMARC policy uses the DNS to allow a sender to indicate that their emails are protected by SPF and/or DKIM. DMARC also suggests what the recipient should do if neither of those authentication methods passes—for instance, delete, none, quarantine or reject the message. For an fTLD Domain, DMARC removes guesswork from the receiver’s handling of these failed messages. It also provides a user the ability to eliminate fraudulent or harmful messages falsely purporting to come from an fTLD Domain. DMARC also provides an optional mechanism for receivers to report back to the sender about messages they receive with DMARC evaluations. p = policy for the domain—this is another required parameter and the values can be none (which takes no action), quarantine (which marks messages as spam), and reject (which rejects the message entirely). The fTLD Domain guidelines suggest using p=none when implementing the Requirement for email. *If you use a non-.BANK | .INSURANCE email address for the rua | ruf tags, you may not receive the DMARC reports associated with your domain unless you have configured an external reporting authorization record in the target domain name. The alignment modes for SPF enables an administrator to manage which parts of the message are authenticated by either SPF. Alignment, for DMARC DKIM, has to do with whether the signing domain used for the signature must strictly match the RFC5322 “From” domain, or if the signing domain and RFC5322 domains must merely be domains within the same organization domain, e.g., proper subdomains of the org domain, or one the organizational domain and the other a subdomain. Since the alignment can be different in diverse implementations, DMARC allows both “strict” and “relaxed” versions of the alignment with the goal of checking against the MailFrom portion of the incoming message. The requirement suggests, but does not require, that the identifier alignment for both SPF and DKIM be set to “strict.” Also, the optional pct tag is helpful during implementation. It can be used to stage and sample your DMARC deployment. Since 100 percent is the default, passing “pct=20” in your DMARC TXT record results in one-fifth of all messages affected by the policy actually receiving the disposition instead of all of them. Parts ofDMARC deployment and mail authentication can be challenging, but there is a large body of information available for implementers and fTLD can help you navigate hurdles and check that your implementation meets our requirements. For those organizations running their own mail and DNS servers, there are both commercial and open source tools to add to existing mail servers. For organizations who want to offload the mail services to a separate appliance several message gateways have built-in DMARC support. Several tools have been released that support enterprise-class DMARC support in large scale email tools (e.g., Hexamail Guard for Microsoft Exchange). For organizations that outsource their email services, there are a variety of third-party providers of hosted email that support SPF, DKIM and DMARC. In addition, it is possible to have a third-party sender relay your mail through a server you provide. Similar to DNSSEC, it is necessary to work with the organization that is hosting your email in order to ensure that when they send email on your behalf it is DMARC compliant. Secondary masters or slave; where the name server gets the zone data from another name server authoritative for the zone, called its master server. Added DNS servers provide zone redundancy, which makes it possible for DNS names in the zone to be resolved for clients if a primary server for the zone stops responding. Added DNS servers can be placed to reduce DNS network traffic. For example, adding a DNS server to the opposing side of a low-speed, wide area network (WAN) link can be useful in managing and reducing network traffic. Additional secondary servers can be used to reduce loads on a primary server for a zone. What is the fTLD Domain Security Requirement for Name Server Host Names? Name server host names must be in the parent zone. This requirement ensures that authoritative name servers are trusted and reliable. These records would state that there are three name servers for example.bank. To help ensure that these three name servers are trusted, the NS records are published in the parent zone. For those organizations configuring and running their own DNS, control over the zone files is simple to arrange. For organizations that outsource DNS and zone management, they will need to work with their third-party provider to ensure that this requirement is met. Operationally, even in situations where a third party is assisting with the configuration and management of the DNS, complying with this requirement is very straightforward. What is a 301 redirect (i.e., URL redirection)? A 301 redirect, also known as URL redirection, is used to automatically forward site visitors from one URL location to another (e.g., www.BankName.com to www.BankName.BANK). A 301 redirect, is key to maintaining a website's domain authority and search engine rankings when the site's URL is changed. It easily sends visitors to a different URL than the one they originally requested -- without having to know or type in a different URL. With a 301 redirect in place customers attempting to visit your .com site, via bookmarks/favorites, links in emails, or by typing your .com domain into their browser, will automatically be redirected to your .BANK site, ensuring all customers can easily get to your new .BANK domain. Even better, a 301 redirect enables you to maintain your search engine rankings from your current .com site on your new .BANK site. Since visitors will be automatically redirected to your new .BANK domain you can educate customers about your move to .BANK on your new .BANK site, as opposed to doing extensive and expensive education ahead of time. Redirection also means you can continue to use current business cards and letterhead until you begin to run low, because your .com address will continue to work, saving you the expense of immediately reprinting all bank collateral. fTLD has implemented HTTP Strict Transport Security (HSTS) at the Top-Level for .BANK and .INSURANCE to declare that web browsers should only interact with .BANK and .INSURANCE websites using secure HTTPS connections, and never via the insecure HTTP protocol. As a result, HTTP websites in .BANK and .INSURANCE are not be accessible in most major browsers (like Google Chrome) due to this HSTS technical control. As a result, you will need to ensure you have a TLS certificate for your .BANK/.INSURANCE domain(s), including for URL Redirection which must be made securely. What is the fTLD Domain Security Requirement for Emergency Situations? In Emergency Situations (i.e., "Incident") Registrants are exempt from the following Security Requirements: DNSSEC, TLS/Encryption, Email Authentication, URL Redirection and those applicable to Third-Party Providers. Registrants are required to provide written notification to fTLD of Emergency Situations lasting longer than three (3) business days by the end of the third business day. The Requirements are an important basis for enhancing the default security posture of registrants and to create a safer ecosystem to maintain trust and facilitate commerce. However, fTLD recognizes that despite best efforts, cyber attackers can from time-to-time bypass or render security controls ineffective, potentially causing significant harm to registrants and their customers. In the course of responding to an Emergency Situation, registrants may decide their existing security posture is untenable and require a new approach to defeat or lessen the impact of a particular threat. Registrants are encouraged to take any action they deem appropriate to protect themselves, their infrastructure and their customers and the Requirements shall not be interpreted in a way to impede self-defense. However, should defensive actions conflict or contravene the technical requirements, registrants must apply for, and, in the meantime, may operate under the presumption of being granted, a temporary exemption to one or all of the technical requirements. Whether or not an exemption to the Requirements is necessary and appropriate, any Emergency Situation lasting longer than three business days requires written notification of the incident by the registrant to fTLD by the end of the third business day. Requirement exemptions and/or notice of incidents lasting longer than three business days must be submitted through the Emergency Situation Notification Form found here: ftld.com/incident-form/. Although some organizations have already implemented measures such as DNSSEC or TLS, many of the Requirements may necessitate changes to the way you deliver services to your customers and the public. Public-facing services such as Web sites and electronic mail may require you to implement new controls as a result of the Requirements. In order to meet the Requirements, additional tasks and features will likely be required in the network. Implementation and use of your fTLD Domain must be in compliance with all relevant Requirements, and the time to implement them will be different for every organization. An organization in full control of its own IT staff can quickly prioritize and schedule according to its own objectives. Whereas an organization not directly controlling (i.e., outsourcing) certain IT functions will necessitate third-party resources and as a result their implementation timeline will to a large extent be dependent upon these resources completing their share of the implementation steps. In all cases, you must meet each requirement before finalizing the launch and use of your fTLD Domain. If you require third-party providers to help with implementation check with your registrar and with your outsourced vendors to see how they can assist with meeting the Requirements and implementing your .BANK or .INSURANCE domain(s). fTLD provides a list of Third-Party Providers for .BANK here: https://www.register.bank/third-party-provider-program/ and for .INSURANCE here: https://www.register.insurance/third-party-provider-program/. Using a third-party provider does not obviate or transfer your responsibility for compliance with the Requirements. Any arrangement with a third-party provider supporting or hosting an fTLD Domain must be compliant with the relevant Requirements, and this may mean that the registrant needs to contractually bind its third-party providers to implement them. For example, if you use a vendor to manage marketing mail-outs to your customers then you likely need to modify your DMARC, DKIM and SPF records to include your authorized third-party email senders. It is your responsibility to ensure your third-party providers comply with the Requirements. Ongoing expenditures will be necessary to maintain, monitor and demonstrate compliance with the Requirements. To illustrate, in a DNSSEC deployment, if you add a new name or level to your second-level domain. For example, if you create a new product or service and a new name to go along with it— www.newservice.yourbank.bank—you will need to re-sign the zone and re-publish it. If you change mail servers, or use third-party email senders, you will need to immediately update the DMARC record to reflect this. You may wish to investigate specialized DNS or email authentication providers that can meet the Requirements, and find new partners to facilitate your implementation. New third-party providers have emerged whose business is built around helping clients meet these kinds of Requirements. fTLD has approved a number of third-party providers that can assist you in complying with the Requirements and they are accessible at ftld.com/third-party-provider-program. fTLD will periodically review and update the Requirements to continue to evolve and stay ahead of the threats they are designed to mitigate. As these updates occur, you will be provided reasonable notice to implement them. Our promise to you is that fTLD will continue work collaboratively with industry and security experts to ensure that the Requirements represent best practices and security measures to ensure the security of .BANK and .INSURANCE domains and your customers’ well-placed trust.